Sweet little baby colt, born a few days ago... They're everywhere lately! Not everything in Amish Indiana is Amish! Gary and I spent a fun several hours at the Hooley Classic Car Auction today. It's held each spring at the Elkhart County Fairgrounds in Goshen, and each fall at the Essenhaus in Middlebury. This time there were 100 cars, plus some non-car stuff the first hour (9 to 10 a.m.) I was amazed at the variety of cars and trucks - a little of everything! Some sold for $3,000 and others for a lot more! One sold for $60,000+. Above, buyers (and Looky-Lous) check out the cars pre-auction. My husband really liked this El Camino in desert tones. More at the auction's facebook page. This thing is huge! Merchandise pours in almost non-stop for days before auction on Saturday. Besides the auction, there is a food building and a number of vendor tents. The merchandise is mostly Amish-centric, and so is the crowd, but for anyone who likes auctions, I'd recommend this one. 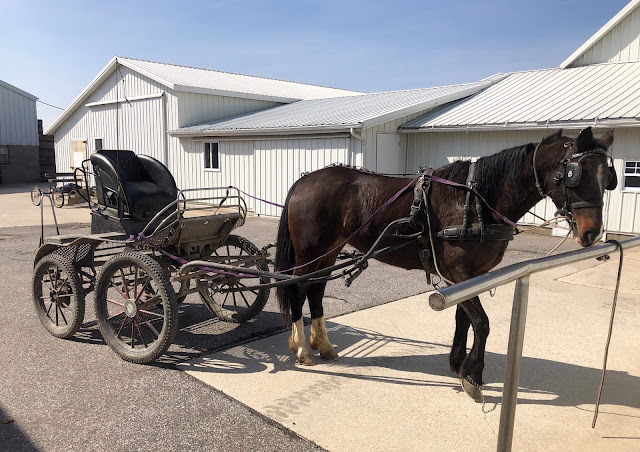 Husband Gary saw this strange buggy downstate in New Haven, Allen County, IN - a "Swiss Amish" area of Indiana. He asked about it, and they said it was imported from Europe and used to train horses. "First things first. I can’t tell you how many times I’ve been asked, “Isn’t taking photographs of the Amish against their religion?” Answer: ” No, it’s not against their religion to be photographed. The Amish religion does, however, prohibit posing for photographs. If you ask an Amish person for permission to take their picture, they will politely say no, as this could be construed as a willingness to pose." I would add to what Wade said, that when six of my Amish friends came to my wedding in suburban Chicago a few years ago, one of them went to the wedding photographer before the service and asked him not to take their pictures. 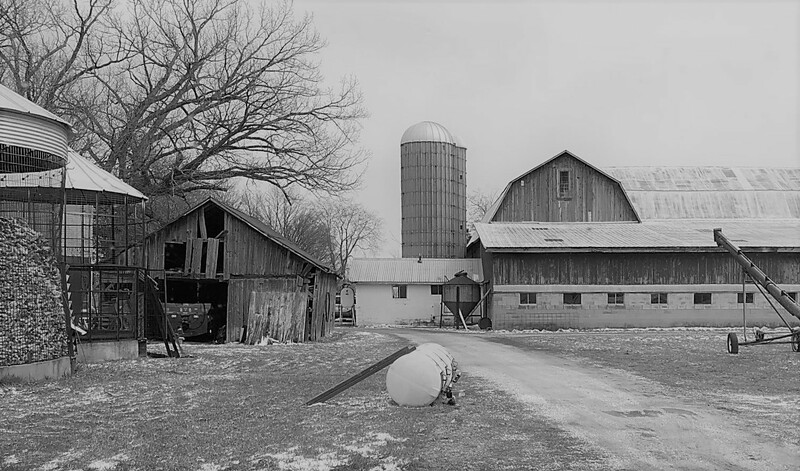 Yet I have taken pictures on their farm of scenery, buggies, animals, and buildings, with no issues. They have even suggested a good photo at times. I would also add, young people who have not yet “joined church” might be seen taking pictures of each other with their cell phones—but that would never happen among church members. Spring: plowing and planting; maple syrup buckets on trees; kids playing softball at school. Summer: hay cutting and baling; flower and vegetable gardens; roadside produce stands. Fall: colorful trees; field work and harvesting; corn shocks in the fields. Winter: snow-covered barns and farms; kids playing in the snow; sunset against the bare trees. 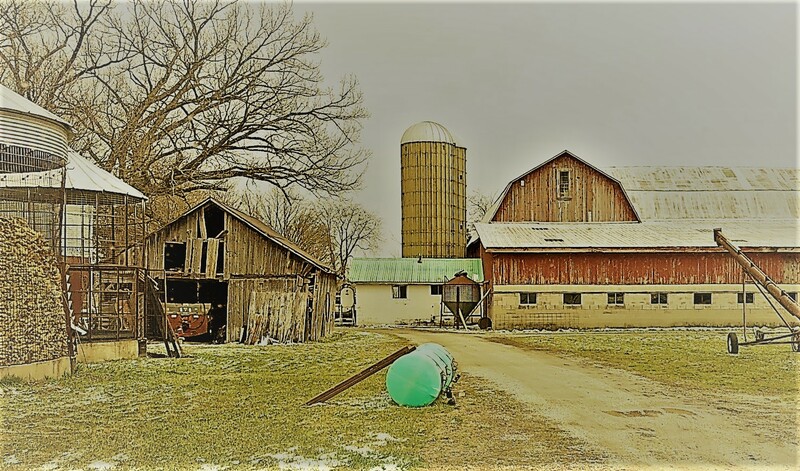 Any time: baked goods on the shelves; picturesque barns; laundry on the line; buggies on the road; interesting signs; animals in pastures along the road; items in an Amish general store. One time, when I was writing about Amish gardens, I stopped at an Amish farmhouse where the wife was sitting out in the yard at a picnic table, and I asked her if I could take a few photos of her garden. She said “Sure!” and we ended up sitting and talking for a while. I find that when I’m taking shots with my phone, it’s best to stay back, get the shot quickly, and move on! Later, on my computer, I can do the cropping that saves the part of the image I wanted. "Try to stay at least 30 feet away from anyone you’re photographing. Don’t go onto private property (including driveways). Don’t be a pest—take a few shots and move along... This is especially true when taking pictures at an Amish school [these days]... A car that drives slowly past a school five or six times could generate a great deal of stress and a call to the county sheriff." I have taken a few occasional photos of children with their faces in view (from a distance), but never adults. It’s just not worth the chance of being seen as another annoying and intrusive “Englisher” who doesn’t respect their beliefs—especially since I live here now. 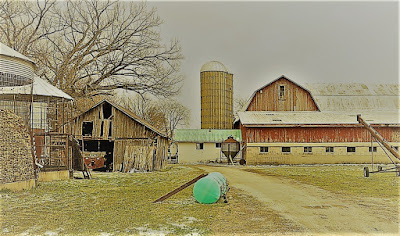 "As you drive along the back roads of Amish country, you’ll come across many wonderful photo opportunities. Please resist the urge to immediately slam on the brakes!... Slow down and look for the widest place to pull over. Don’t stop to park just after passing over a hill—people coming up from behind may not be able to see you until the last second. Turn on your hazard lights, then take your photo (all the while keeping an eye out for traffic)." You can read Wade’s whole article here. You can find out more about Wade Wilcox and his photography business here. I started taking a look at the “Sunday suits” that Amishmen wear for church, weddings, and funerals. All of them are made in the same style, and always in black with a white shirt. Some women make them for their husbands and sons, but they are more complicated than the typical Amish clothes, so often they are purchased off-the-rack or custom made. They are very well made, I noticed, with quality materials and linings and a high quality of construction, so they are not inexpensive! The above photo shows the jacket, pants, and always-white shirt. The suit is called a “mutza” in the Pennsylvania Dutch language. The long-sleeved white shirt is much like an “English” dress shirt, and is seldom homemade. The jacket differs from an typical “English” men’s suit in the plain collar and the lack of front buttons or outside pockets. (Hooks and eyes are used to fasten the jacket.) The Amish avoid buttons on nearly all clothing except the small buttons on children’s clothing and boys/men’s shirts and on the front of men’s pants, as buttons represented the military back in Switzerland and Germany, and the Amish were often persecuted for their refusal to serve in the military. The vest is an important part of the ensemble. In hot weather, the jacket is taken off or not worn—just the vest, which is much cooler. I noticed that the price tag on the vest was $79.95. The pants differ the most from an “English” men’s suit. Like all Amishmen’s pants, they are an old style called “broadfall pants”—which is to say, they are not closed by a fly, but rather by four buttons across the top of a large panel. (I have lightened the black color of the photo in order to show the details.) Suspenders are worn with the pants, not a belt. Black dress shoes complete the ensemble, along with a black felt hat. I have noticed that the hats run about $120 and are very high quality. The men take very good care of them! These felt hats are worn only for dress occasions. Driving by a church gathering, wedding, or funeral and seeing the dozens of men and boys in their black and white dress clothes is very impressive. Much expense and care go into their Sunday clothes, and it shows. by Erik Wesner on his website amishamerica.com. There’s a new store in Topeka, a little town south of Shipshewana. It sits where an old building burned down a few years back. This spot—Topeka General Store—is one of my new favorite places to browse when I’m in the area. Although it’s set up with Amish customers in mind, there’s plenty to see (and buy) for the rest of us. There are sections on indoor décor, outdoor décor, sports and outdoor gear, sewing supplies, books, toys and games, cleaning supplies, household goods, wedding supplies, and every type of clothing the Plain People could ever need. The photo below shows that the clothing section (like the rest of the store) is definitely Amish-centric. Which is a good thing, since Topeka is a very small community “out in the middle of nowhere” with very few shopping options. This store definitely fills a need. They even have tiny shopping carts for little shoppers! But one of my favorite things is watching the belt-powered ceiling fans… it’s almost hypnotic. A long shaft on one wall is connected by a belt at the lower end to a power source (gas generator) which sits outside the building. At the top of the turning shaft, more belts transfer the power to two horizontal belts, which run the two rows of ceiling fans. I could watch them for hours! I recently retired from being administrator at an elder law firm in Aurora, IL. I also like doing genealogy for fun and profit. We always loved visiting Amish Indiana, so in June 2017, we moved there. All photos and content copyright 2013 Susan Wallin Mosey. Awesome Inc. theme. Theme images by enjoynz. Powered by Blogger.